The CV Toner helps deliver graphic design quality by providing vibrant and highly consistent quality with a wide color gamut on a broad range of media. State-of-the-art, 32-beam Red VCSEL laser achieves 2400 x 2400 dpi and outputs crisp, clear color images with remarkable clarity and definition at high speeds. It also features several halftone screen patterns for increased flexibility and optimized quality on various types of images. With a start-up time of six minutes or less and a first-copy-out speed of under 7.7 seconds, the imagePRESS C65 is ready when you need it. Production speeds of up to 65 ipm on a wide range of media help keep you on track. The imagePRESS C65 color digital presses offer automatic, real-time calibration and provide tools to help reduce calibration time to reliably deliver high-quality, repeatable, predictable output with minimal operator intervention. Developed for advertising agencies, graphic design studios, packaging design and architectural firms, the imagePRESS C65 produces high quality output and at print speeds of up to 65 LTR impressions per minute in color and black-and-white with a fast start-up and first-print-out-time, the press is readily available to help bring visual artists’ ideas to life even faster. The imagePRESS C65 can print at rated speed on uncoated media up to 80 lb. Cover and supports media up to 110 lb Cover and validated heavier stocks up to 130 lb. Cover providing customers with the flexible media options needed to expand their creative abilities. By combining 2400 x 2400 dpi print resolution with the renowned imagePRESS Gloss Optimization technology and color consistency in its class deliver vibrant, reproducible image quality excellence. In addition to producing color critical applications such as layout proofs, press proof comps and packaging markups, the imagePRESS C65, combined with optional in-line finishing, efficiently produces style guides, planograms and presentations. 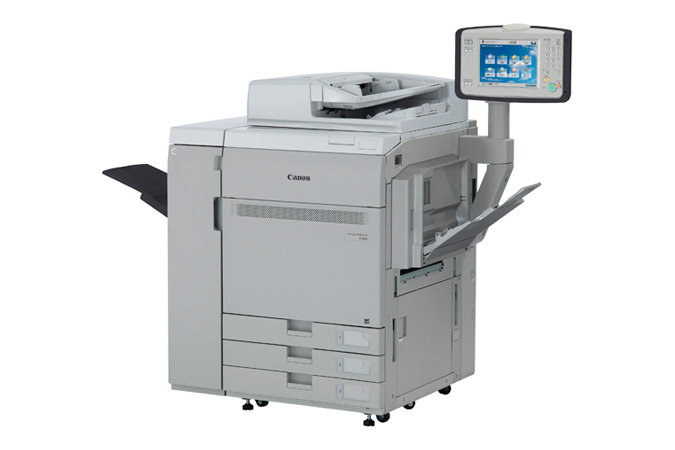 Lastly, meeting ENERGY STAR® standards, having received an EPEAT® Gold rating and being RoHS compliant, the imagePRESS C65 color digital press helps organizations reduce their environmental impact and energy cost.